Politics is broken. Technology risks making matters worse. But transhumanism can fix it. Comprehensively. Via the profound application of technology that uplifts the best qualities of humanity, enabling unprecedented health, intelligence, wellbeing, democracy, and liberty. With no-one left behind. 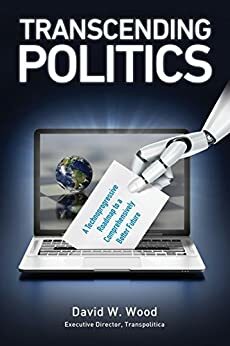 These are the core claims in the book "Transcending Politics" by David Wood, former smartphone industry executive, who is now chair of London Futurists and executive director of Transpolitica. David W. Wood, D.Sc., was one of the pioneers of the smartphone industry. He is now a futurist consultant, speaker and writer. Wood spent 25 years designing, implementing, and avidly using smart mobile devices. This includes ten years with PDA manufacturer Psion PLC, and ten more with smartphone operating system specialist Symbian Ltd, which he co-founded in 1998. At different times, his executive responsibilities included software development, technical consulting, developer evangelism, partnering and ecosystem management, and research and innovation. His software for UI and application frameworks was included on 500 million smartphones from companies such as Nokia, Samsung, LG, Motorola, Sony Ericsson, Fujitsu, Sharp, Siemens, and Panasonic. From 2010 to 2013, Wood was Technology Planning Lead (CTO) of Accenture Mobility. Wood is CEO of the independent futurist consultancy and publisher Delta Wisdom. Delta Wisdom helps clients to anticipate the dramatic impact of rapidly changing technology on human individuals and communities, and highlights opportunities to apply technology in new solutions to deep-rooted problems. As chair of London Futurists, Wood has organised regular meetings in London since March 2008 on futurist and technoprogressive topics. Membership of London Futurists reached 7,000 in February 2018. Wood's previous books include Smartphones and Beyond: Lessons from the remarkable rise and fall of Symbian (published in September 2014) and The Abolition of Aging: The forthcoming radical extension of healthy human longevity (May 2016). He was also the lead editor of the volume Anticipating 2025: A guide to the radical changes that may lie ahead, whether or not we're ready (June 2014), and two collections of essays by Transpolitica consultants: Anticipating Tomorrow's Politics (March 2015) and Envisioning Politics 2.0 (June 2015). Wood founded the political think tank Transpolitica in January 2015. Wood has a triple first class mathematics degree from Cambridge and undertook doctoral research in the Philosophy of Science. He has an honorary Doctorate in Science from Westminster University. In 2009 he was included in T3's list of "100 most influential people in technology." He has been a Fellow of the Royal Society of Arts (FRSA) in London since 2005, a Director of Humanity+ since November 2013, and a Fellow of the IEET (Institute for Ethics and Emerging Technologies) since January 2015. He blogs at dw2blog.com and tweets as @dw2.